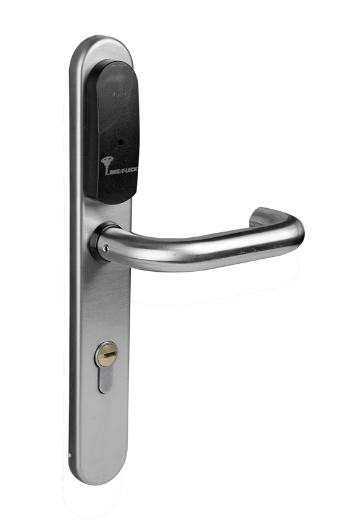 For a convenient, yet highly effective security solution, Mul-T-Lock have built and designed a simple to programme and easy to install Access Control Lock. Perfect for organisations and businesses from a wide range of sectors – office buildings to airports – the SMARTair can be mounted directly onto almost any existing mechanical lock for a number of door types such as; glass doors, interior doors, emergency exits, lockers, cabinets and many more. The stylish design comprises a number of convenient features such as; authorisations, time schedules, event logs and instant cancellation of lost or stolen electronic cards. Efficient Remote Management available from a PC to control scheduling, authorisations and remote door opening. Sleek, smart design for any building aesthetics. Protection for all access points – ANSI cylindrical, mortise locksets & extra trim devices; cabinet locks, readers and accessories. The SMARTair Access Control System is available in 6 different versions. This lock can manage multiple door access with the easy to use portable programmer free of any burdensome computer connections, with its contactless smart cards. The SMARTair Offline can be upgraded with this new feature by utilising users’ cards to pass information from a central station to multiple doors throughout the premises. Controlled from the managers PC, notifications are instantly recorded of any ‘event’ at every door, allowing changes to authorisations and schedules, as well as opening doors from the comfort of your desk. Upgrade from the SMARTair Wireless so you can control access anywhere and at any time. Connected to the managers’ PC, laptop, tablet or smartphone the SMARTair web allows you to receive alerts, give/change authorisations, collect detailed audit trails and open doors remotely. With no complicated software and programming devices, the basic Access Control secures a single door, allowing you to authorise and cancel electronic access cards with a simple programming card. The E-motion lock is a keyless electronic lock designed specifically for lockers with the option for integration with other SMARTair systems already installed on the premises.